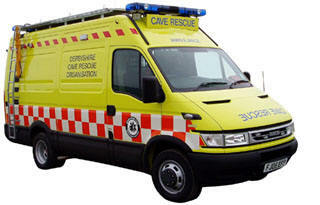 ASK FOR CAVE RESCUE FROM DERBYSHIRE. A page to record trip details to leave with a call-out person can be downloaded HERE. The rest of this page describes the organisation of rescue by cavers for cavers and others. Cave Rescue is organised on a voluntary basis throughout the UK but the service provided by cavers for cavers is recognised by the authorities as the best way to recover people from caves and mines (other than working mines). The basis for cave rescue is currently in a document entitled Search and Rescue Framework for the United Kingdom of Great Britain and Northern Ireland (SAR framework) which was published in 2002 and republished in 2008. According to this document, the responsibility for the co-ordination of land-based and inland waters search and rescue (SAR) rests with the Police Service and is derived from their duty to protect life and property. Nationally, cave rescue is co-ordinated through the British Cave Rescue Council (BCRC) which is referred to as a Voluntary Inland SAR Team in the SAR framework (along with mountain rescue). That states that "The Voluntary Inland SAR Teams are organisations formed to provide SAR services on land. Operationally, each team is responsible to, and works under the authority of, the Police Service. Though each Team [e.g. DCRO] is independent, their common interests are represented by ..." the BCRC. Therefore, any work by the cave rescue organisations and by clubs such as the DCC is defined as being to assist the Police Service in their duty. It is acknowledged in the 2008 edition that "The organisations are usually based in one of the main caving (ie limestone) areas and their operations almost exclusively take place in those areas" which suggests that the Police may be less inclined to use the DCRO in Cheshire, for example. Alongside the DCRO, we must also recognise the existence of the Cheshire Search and Rescue Team (http://www.cheshire-sarteam.org/) which works closely with the police to the extent that the police have donated a vehicle to them. The DCRO (see http://derbyshirecro.org.uk from which some of the information on this page is taken) is one of sixteen CROs in the UK covering the major caving areas and adjacent counties. Although called the Derbyshire CRO, DCRO covers cave and mine exploration in a number of counties ranging from Warwickshire to Norfolk to our own Cheshire. 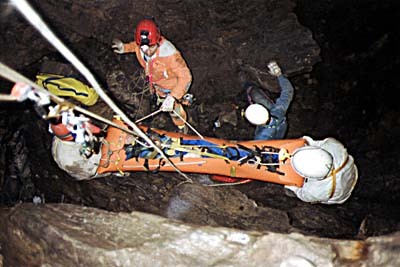 This arrangement is part of the BCRC plan for rescue across the country and is contained in the BCRC contact list (see http://www.caverescue.org.uk). Almost all DCRO's search and/or rescue operations take place in the limestone areas of the Peak District but occasionally help is given to police forces outside Derbyshire, not only to incidents in caves or mines, but also in other underground places such as wells and tunnels. The responsibility for organising and running DCRO operationally lies with the controllers (usually around five) assisted by the leaders (usually six to eight) and equipment officers (usually four). Holders of controller and leader posts are appointed by the committee and are assessed annually. At most incidents a controller will be in charge on the surface and another underground. DCRO's main base and equipment store is in a building behind Buxton fire station which is occupied courtesy of the Derbyshire Fire and Rescue Service. The rescue vehicle is kept there together with the bulk of the equipment. The vehicle is kept loaded with all the equipment necessary to carry out most operations and further specialised equipment (for diving, engineering etc.) can be loaded on board if required. It used to be part of the DCC's aims to maintain a rescue team which was called the Western Team. However, incidents very rarely occurred that involved this team and there were even fewer at Alderley Edge. As a result, a few years ago when training requirements became stricter for the bona fide rescue teams, it was decided not to try and maintain a Western team but to provide support to DCRO on an individual basis in the Peak District or an ad hoc basis at Alderley. This means that an Alderley rescue is a DCRO rescue but DCC members help with facilities, directions, underground leaders and people if required. At present, there are probably only a few members of the DCC who are trained members of DCRO: Allan, Kieran and Tom. Other members, including Nigel, are non-core members who are involved in rescue but not fully and regularly trained. Anyone can become a non-core member but core members must attend training and go through a probationary period. 1 Any call for the cave rescue must go through the Police (via 999) to DCRO who are contacted by Derbyshire Police control room. 2 The DCRO will turn out a rescue team unless contact is made with a competent DCC person and the incident is within the capability of DCC (i.e. search or recovery that does not require carrying out of a casualty). 3 If the DCC can deal with the incident, a DCRO controller will maintain contact by telephone or by attending the incident. 4 On calling out DCRO, whether anyone attends from DCRO or not, the rescue is covered by Police service insurance. Without a callout, any injury or harm caused by the actions or negligence of DCC members during the rescue could fall to them as a personal liability. These arrangements apply for Club members and the public at large. If a problem arises, you can try one of these numbers which should only be used for rescue purposes. These are not 24 hour numbers. In emergency: YOU MUST USE 999 AND ASK FOR CAVE RESCUE.